Twenty characters from Nintendo and Sega's hallmark series come together once again to take part in a series of official Olympic sporting events. Events new to the series include soccer and equestrian events, which join traditional events such as athletics, swimming and table tennis. 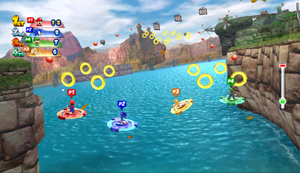 Also new to the series are the Dream Events, which are fantasy sports set in the Mario and Sonic universes.